I’ve been planning to write about Paul’s Place—or as it is formally known as Paul's Place Famous Hotdogs—for the longest time. I originally heard of the place many years ago. In fact, my first visit was probably in the late 80s or early 90s. If I am not mistaken, at the time, Paul’s Place boasted multiple locations. Now, it’s back to just the original. This was my third visit. A couple of years ago, I had visited around the Holidays with every intention of penning a review, but time got away from me and I failed to remember enough to write about their dogs. The inside has a feel of days gone by. Various canned goods, t-shirts, and tractor-type souvenirs are set out for sale under harsh fluorescent lighting. Numerous simple tables with Coke-carton condiment holders provide ample “dining” room. A counter for ordering and picking up food and a hand-dipping ice cream case separate the eating area from the kitchen. It’s a utilitarian and yet nostalgic establishment. I remember not being very impressed upon my first visit. It’s all very hazy now, but I do remember not caring for Paul’s Special Sauce. It’s a ketchuppy concoction that’s a bit like relish, and being a Carolina Hotdog fan, relish never was my favorite. “All the way,” includes the sauce, but luckily Paul’s sells hotdogs without that special sauce. 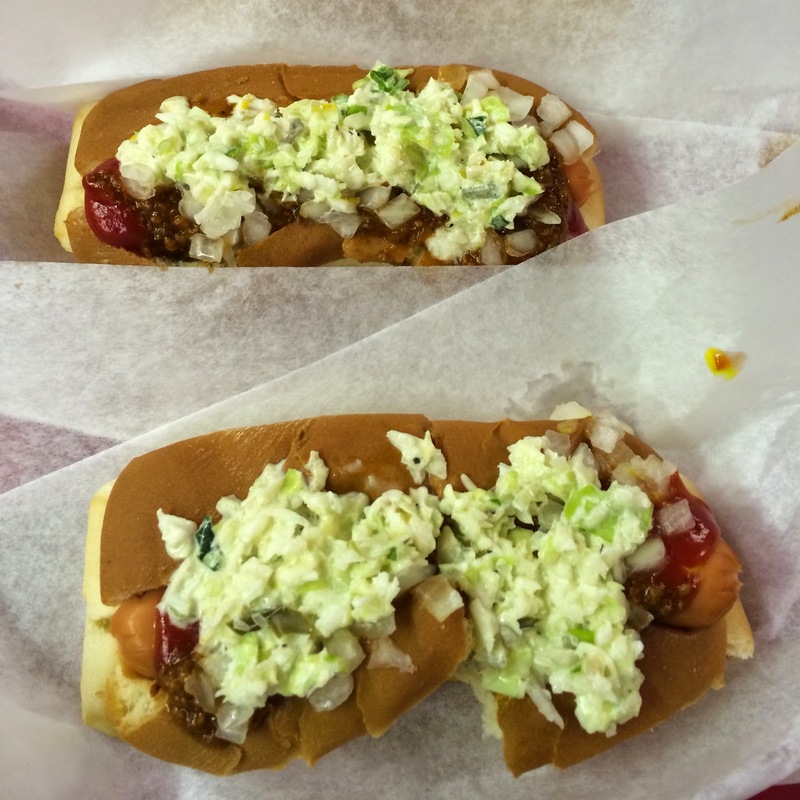 Sure enough, they sell classic Carolina Hotdogs with mustard, slaw, chili, and onions, and that’s how I ordered mine. Sadly, the person taking my order got it mixed up and added ketchup, but I didn’t want to be wasteful; because it was my third visit, I can wrote around it and recall the previous visits. The dogs weren’t bad. They weren’t my favorite ones, either. The slaw was a bit too pickle-y and the chili didn’t add a lot. The chili reminds me of that which I encounter regularly; it has meat but is a thickish liquid with lumps of meat. I don't know what thickens the liquid, but I know I like a seriously meaty chili without a lot of liquid--some, but not a lot. And it should add a nice chili punch! It seems this is what I thought upon my first visit. I liked them a bit more on my second visit, but even then, I wouldn’t put them near the top of my all-time favorite hotdogs. If you’re in the area and hankering for a Carolina Dog, this one will do, but I’m on the lookout for better. Post Script: Since I wrote this review, TNT's Good Behavior, starring Michelle Dockery, shot some episodes at Paul's Place.